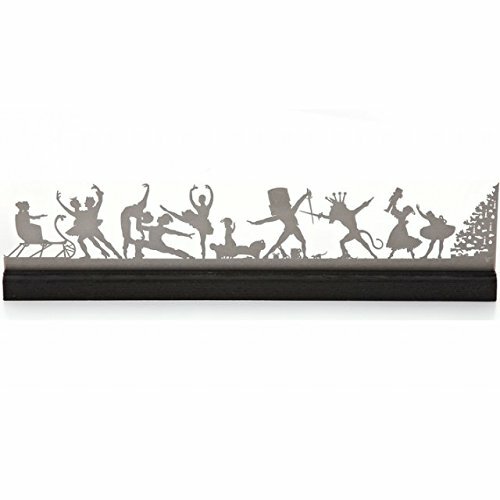 Mantel Nutcracker Ballet captures the joy and merriment of Christmas, in one horizontal view using silhouettes of scenes from Tchaikovsky's beloved ballet. The windup doll with Clara's brother, Christmas tree, Clara dancing with the Nutcracker are all here along with the Rat King, Sugar Plum Fairy, Arabian and Russian dancers and the King and Queen. Enjoy the story for years to come, not just one night. This original art piece made of laser-cut stainless steel with a black wood base will be a beautiful addition to your festive decor and a cherished reminder of a holiday classic. It is the perfect gift for the dancer in your family! As an eye-catching, holiday sculpture it is great for small spaces and is a cinch to set up and take down. This dynamic art piece is perfect for your home or collection and can be easily stored flat for future years. It arrives beautifully packaged in a protective pocketed cloth that can also be used for display and exquisite gift box. Why buy from Valerie Atkisson Design? Valerie loves to tell classic stories in a style that resonates with contemporary decor. There are strong symbolic and conceptual elements in her handmade designs that elevate the utilitarian or decorative object to realm of art. Valerie's products are made in the USA. All materials made from recyclables and services are locally contracted whenever possible. If you have any questions about this product by Valerie Atkisson, contact us by completing and submitting the form below. If you are looking for a specif part number, please include it with your message.